Ron, Sue and Neely shared their bounty of pomegranates. Kevin and Jessica brought tools and strength. 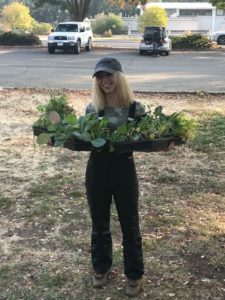 Kristina from Lemuria donated two flats of vegetables. Divina brought her infectious joy. There are too many generous acts of kindness to list. With facemasks on, members of our Solano community came together to build a garden and somehow exist between the speechless beauty and bottomless grief. Even though I felt deep gratitude, for the kindness of the community, I awoke on the Sunday after the final installation feeling weepy and moving around my home directionless. Then I remembered that I came home from the installation with pomegranates! I got lost researching pomegranates and the best way to separate the seeds for juicing. As I separated the arils, I had a few bowls next to me. The worms got the membrane; the chickens received some of the arils that I was too lazy to separate. I pressed a beautiful burgundy apple pomegranate juice for my family and saved the peels of the pomegranate in the freezer to make a tea. While I got lost in the task I listened to the Mr. Rogers documentary, “Won’t you be my Neighbor?” The tears began to flow as he relayed his mother’s advice that when something is happening that is scary to always look for the people that are helping. I just spent three Saturdays surrounded by the people that are helping.